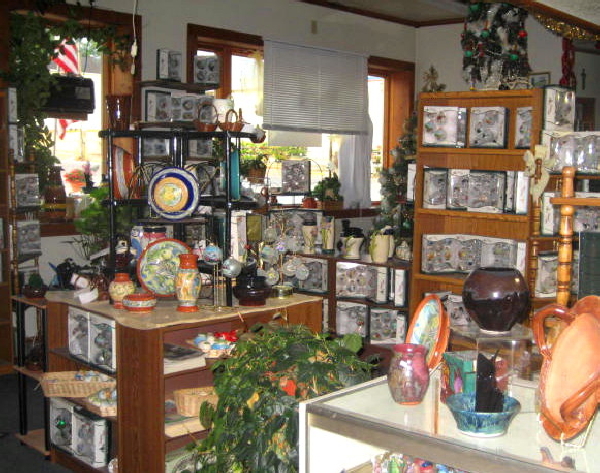 Maria's Art was established in 1977 in the basement of her home in Monticello, Iowa. Basically working in clay, the business soon overtook the entire house and in 1979 Maria moved to a building on South Locust Street in Monticello where she could expand her creativity. In 1982 she was asked to create a limited edition ornament and from the simple beginnings of "Limited Edition" ornaments of the historic buildings of Stone City, Iowa, the one time art colony of Grant Wood, ornaments hand painted by Maria now have been shipped all over the world. For 20 years, the 1200 square foot overflowed with clay, kilns, and ceramic students and glass ornaments stacked all over. "It is time to move to a larger location" she said, and when the opportunity came in 1999 she moved to a downtown location with now over 4000 square feet where she could have her own office space, kiln room, painting area, business office, showroom and a shipping area. People from all over the country have stopped to browse the showroom. Maria's Art has flourished because of the quality of her work on each ornament that is hand painted one at a time and the exacting craftsmanship of each piece of pottery. Specialty ornaments of houses, historic buildings, pets, vehicles, commemoration of special events, can be created by simply submitting your photo. She is proud that she only uses American products. Maria has been featured in many newspapers and publications throughout the country, and is well known for her "specialty" hand painted ornaments. She has worked for many realtors across the country, painting ornaments with their client's homes. Among her many clients are famous celebrities, the staff of Buckingham Palace, travel agencies and various corporations and businesses, and specialty ornaments for ethnic festivals across the country. In 2007 The "Art of GLAPÒ" was conceptualized by Maria and fellow Monticello stained glass artist Charlie Tonn. From the ancient ruins of early civilizations we find that pottery was an integral part of society. Some cultures took these ancient utilitarian items and began creating beautiful pottery pieces that have become revered as works of art. From this beginning has evolved many forms of modern day pottery. 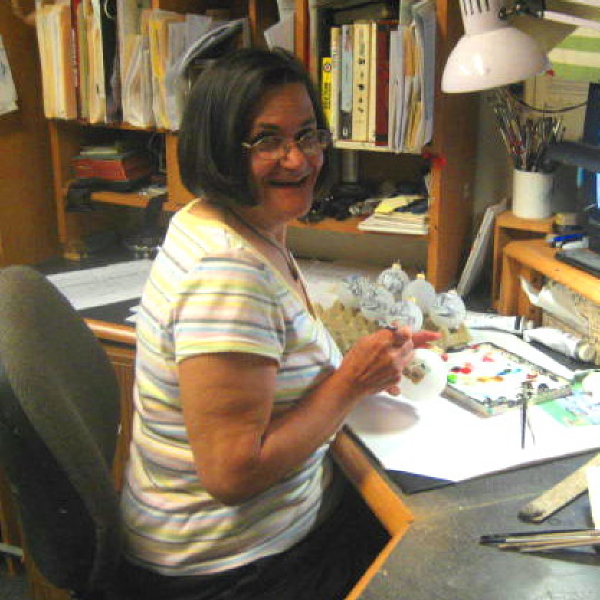 Maria White, clay artist of over 30 years, has captured the beauty of true art pottery. Maria has been seen throughout the world and now focuses on bringing her magnificent talent of clay into a unique and different direction. But just as peaches are enhanced and made more pleasing to the palette with the addition of sweet cream, so too was it discovered that the beauty of pottery art when blended with the magic of Charlie Tonn's stained glass becomes an object of unique magnificence that pleases the eye and soothes the need for beauty that lingers in all of us. Both invite you to explore the world of Glapò. Educationally trained in fine art, Maria also does illustrations and commissioned oil paintings. Most recently Maria illustrated an "Italian" cookbook and has done many special illustrations for businesses.